Mr Van der Bellen was responding to a question from a schoolgirl who argued a ban on Islamic headscarves or veils would reduce women to their appearance, rather than accomplishments, and shut some out of the labour market. His comments were made in March but emerged after being broadcast on Austrian television, amid debate in the country and neighbouring Germany about “burqa bans”. 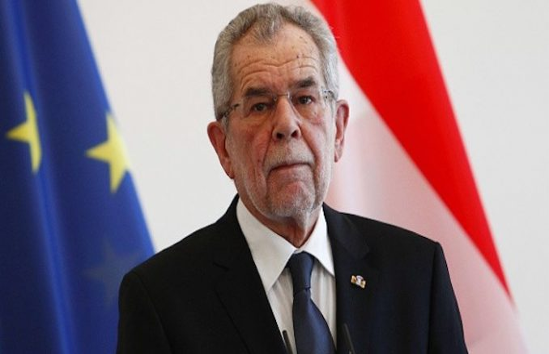 A spokesperson said that following Isis-linked terror attacks across Europe, Mr Van der Bellen would like to see Muslim representatives in Austria make “clearer statements” emphasising that the atrocities could not be justified within Islam. The President’s office said he believed prohibitions were only justified in select circumstances, such as for female judges, where religious dress could raise questions over their professional neutrality. Mr Van der Bellen would apply any restrictions to all religious symbols equally, including Christian crosses and Jewish kippas. Despite the President’s left-wing background, the Austrian government is a coalition between the centrist Social Democratic Party and conservative Austrian People's Party. The populist Freedom Party of Austria has pushed for policies including a partial ban on full-face Islamic veils in courts, schools and other public places, which was announced in January. The partial prohibition, which has not yet come into effect, would apply to the niqab and burqa but not headscarves (hijabs), which cover the hair and neck only. But the government also agreed to prevent police officers, judges, magistrates and public prosecutors from wearing headscarves in the interest of appearing “ideologically and religiously neutral”. Thousands of people took Vienna’s streets to protest the proposed legislation, which was dismissed as a knee-jerk reaction to appease the far-right as the coalition floundered. Debates over restrictions on Islamic veils have reignited in Europe following a wave of terror attacks and the refugee crisis, which sparked concern over integration. The German parliament voted in support of a draft law banning women working in the civil service, judiciary and military from wearing the burqa and niqab on Thursday. Thomas de Maiziere, the German interior minister, argued that the ban was compatible with integration, which “means that we should make clear and impart our values and where the boundaries of our tolerance towards other cultures lie”. Angela Merkel announced her support for the move in December, saying full-face veils were “not acceptable in Germany” and calling them to be banned “wherever it is legally possible”. Dutch MPs voted for a similar prohibition in the Netherlands last year, covering public transport, education, healthcare and government buildings and punishing any infractions with fines. Support for bans on full-face veils has been growing across Europe since France became the first country to implement such a law in 2011, followed by countries including Belgium and Bulgaria, with partial bans being imposed in Austria and parts of Spain, Italy and Switzerland.